As Microsoft's X10 event continues, more and more details about Bungie's upcoming Halo title are (ahem) coming into reach. 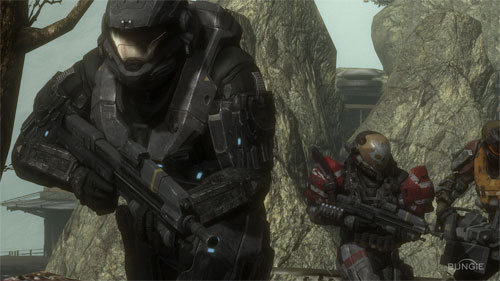 The official start date for the Halo Reach multiplayer beta is May 3. If you have a copy of Halo 3: ODST, you can participate in the beta. If Bungie follows the pattern for the Halo 3 beta, it's likely Reach will be versus multiplayer only, though we here at Co-Optimus are holding out for a Firefight-like mode as well. No Super Spartan Ball party games even? Fine by us. Not so fine, though, is Game Informers's news that the five Spartans of Noble Team, revealed in previous Reach trailers, are NPCs only. So much for our dreams of five or six player co-op. Additional players in the campaign will all share the same role, similar to that of the Rookie in ODST. Disappointing, yes, but still, it's Halo, it's co-op, what's not to be excited about?